Home > 2015 > 04/25 > Which Boston Bruins players might the Oilers target this offseason? Which Boston Bruins players might the Oilers target this offseason? NHL people are like people anywhere: when they find something that works they generally stick with it. It’s not uncommon to see new general managers or coaches reach back to their old organizations for talent; they know the players, know what they can do and it only makes sense to grab a known quantity rather than roll the dice on a newcomer. 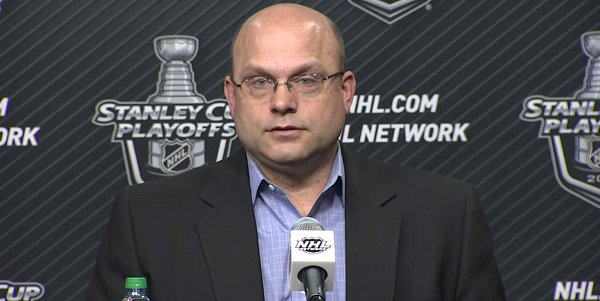 We know from his time in Boston that Peter Chiarelli isn’t an exception to the rule. So which Bruins might be both a) plausibly available and b) a good fit for Edmonton? Zdeno Chara. Chara established himself as one of the handful of elite defencemen in hockey with Boston, after the Senators unwisely prioritized Wade Redden ahead of him. He was a key ingredient for the Bruins for the entirety of Chiarelli’s tenure. Chris Kelly. This one took a few years, but the Ottawa drafted-and-developed Kelly was eventually dealt to Boston and played some very good hockey for them, particularly during the 2011 Cup run. Andrej Meszaros. Meszaros bounced around the league for a while between his time in Ottawa and Boston, but the Bruins acquired him at last year’s trade deadline as a rental piece. Peter Schaefer. Schaefer had a disappointing tenure in Boston, eventually getting demoted to the minors and retiring not long after. One player who didn’t spend time with Chiarelli in Boston, but who would be familiar to the new G.M. from Ottawa is Antoine Vermette, who is an unrestricted free agent of some note in this summer’s class. The obvious name on the Bruins’ roster is Dougie Hamilton, a brilliant young defenceman and pending restricted free agent. He’s come up several times in the comments section at this site, and for good reason. However, I’m not going to spend much time on him because I can’t imagine that Boston would be stupid enough not to re-sign him. They have cap limitations, but locking down the heir apparent to the No. 1 D job is the kind of thing that even cap-strapped teams generally manage. Carl Soderberg. He’s a logical candidate if Chiarelli wants to bolster the forward corps. The 29-year-old pending free agent brings size (6’3”, 216 pounds) and a range of skill and can play centre or left wing. He’d be a nice piece of insurance up front, or potentially a replacement for a player dealt for help on defence. Milan Lucic. Lucic is still a year away from free agency, but his name crops up frequently in trade rumours (and has for a while now) and he’s been a coveted player in the Edmonton market for a long time. He has limitations, but he’s still reasonably young (he’ll turn 27 in the summer) and would add an element to the team’s skill lines that is often lacking. Malcolm Subban. He’s a top goalie prospect on a team with a long-term incumbent, and Edmonton’s system isn’t exactly overflowing with gems. The emergence of Laurent Brossoit as a legitimate AHL starter, combined with the need for an immediate fix at the NHL level makes this deal problematic in some ways. Adam McQuaid. A big defenceman with some puck-moving limitations, McQuaid is a pending free agent and might appeal in a No. 6/7 capacity. Gregory Campbell, Dan Paille and Matt Bartkowski. These are the other pending free agents on the team. All have warts that make them problematic for Edmonton, but all might be plausible fits in limited roles. Edmonton’s greatest weaknesses (defence and goaltending) don’t really seem solvable from players that Boston is likely to make available, but it wouldn’t be at all surprising if the Oilers turned to an ex-Bruin for help up front if that position is deemed to need immediate fixing. Or, for that matter, if players up front are cashed in via trade for help on the back end. Lucic would fit in Edmonton. He brings the Semenko element, w/ a little more skill. He’s slowed a bit, but still put up 40+ pts. Only 2 oil players broke 50 pts this year. He offers size, grit, attitude, playoff exp, and has a cup. Playing in the west, you need to throw your weight around. This guy’s tough, and will step up for the young core, and he can hold his own. Oilers have 18 mill in cap space. Buy what you need. Never mind any Bruins, we should target Devan Dubnyk who is a Vezina nominated goalie. With all this talks about tradings and McCain. Are we gonna win the Stanley Cup next year guys? We better! Lose the effing clown-outfits that the ‘glory days’ boys have been making the team wear. Not only does ‘COPPER and blue’ sound cooler, it IS cooler than whatever the hell colour orange that is supposed to be. I want to see the Mcfarlan 3rd jersey make an appearance again. I liked those. Stormy applause! Here comes same-thinking brotherhood. I didn’t find any infernal orange not in heraldry of Edmonton or Alberta. But find two shadows of copper and blue. Mandarin looks good in 80’s. Now very cheap. Out of taste, of style, of city/province heraldry, just ugly. Nearly half-year I’m working over new style. Based on Copper’n’Blue. And will send them any time, when/if they need. Gratis. I’m fan, no payoffs. I personally am a fan of tradition to a certain degree and think the team colours shouldn’t be messed with. Legendary sports teams worldwide are known for their colours and I think the Oilers can be considered in that league despite the seasons of shame. The Habs, Leafs, Wings, and Flyers have had the same colours since the beginning of time and I think of football clubs who always keep their main colours. Man United have been the Reds, West Ham the claret and blue, PSG with their navy blue red and white and the Mighty St Pauli with their brown, red and white to name a few. The history of the colours is one thing that allows generations of fans to connect if that makes sense. I just saw some Canuck pre game highlights and seeing Linden in his jersey cheering in the old colours they had just seemed weird as its nothing like what they currently wear. Do the Canadians change. No. Neither should we. An occasional 3rd jersey is nice, but the jersey stays. Carl Soderberg only please, 2 years or a tradeable contract. Please no trades in our conference that involve Ebs, Hall or Nuge!!!! Nashville has the #2 (Wilson) and tied for #3 (Forsberg) goal scorers in the playoffs. Chiarelli offers Dubynk $4M for 3 yrs. Anybody in??? What a success story this will be if it happens. Would Dubynk not jump to the opportunity. I see Dubynyk’s return with new management, new coach, McDavid with a support cast on its way, new arena, & most important, Eakins/McTavish & Lowe….GONE. Don’t get too Chia excited. He got fired for putting a team in cap issues that missed the playoffs. How does his last 2 years look? Lucic is not the be all, and end all for adding “Heavy”. Joel Ward (UFA), Eric Fehr (UFA), Scottie Upshall (UFA), Matt Beleskey (UFA) – who IMHO is on the verge of being seen in the same light as Lucic. No reason to sell the farm to add Lucic! Tampa Bay might be a good place to look for salary dump opportunities. Next year will bring a big raise for Bishop, and a complete season of Coburn. Matt Carle is a little overpaid (3x 5.5), but still good. Andrej Sustr is young, humongous(6’8″ 225), and an RFA in need of a raise (13 assists, 72 games). Valtteri Filppula is their third C at 3x 5 mil. I don’t think he’s be good for us though. Brian Boyle is a huge C and is only 2x 2 mil. He is not a top 6 guy though. Jason Garrison is a solid D at 3x 4.6 mil. He’ll be pretty low on their move list. Victor Hedman is at a bargain 2x 4 mil. He is injury prone and his movement is pretty unlikely. Could be a deal to make somewhere here. I could be way off here but I would look at a few other things not mentioned. What Sean Burke seems to do with goalies is something impressive so he would be the first call I would make to see what it would take to bring him over as a Goalie coach and heck if it means adding another title as he seems to have management aspirations, do that as well. I’m in the minority here, but I’m not sold on Scrivens, I thought Bachman was a more than capable backup and he would be available for a lower cap hit. Might be unpopular, but if Scrivens could be traded, I wouldn’t say no. As for a number one, I’m drawing a blank as no one has been lights out. Maaaaybe the Pens may want to part with Fleury, as their first round exit could mean some heads will roll. But for the most part I’m unsure of who could be the answer as it is also dependant on the Defencemen the Oil hopefully get. Finally before any trades to be made, see what can be had in the Free Agent Market as there are a fair few D available, like Oduya, or Green for example and I am not sure if Edmonton is a better destination with the moves they have made and McDavid, but I think the Oil may not be at the bottom of the pile anymore. One of the few players I would look to see if they are available or not is Byfuglien, as in my view he is what the Oil really need with his versatility, size and that mean streak that would give them that nastiness that isn’t really there. The fact that the Oil have made more moves that any of the other non playoff teams is impressive, and once the actual Cap is known, and the playoffs are over it will be clearer which teams are going to be tight to the cap and need to offload salary. Will also be good to see who would be interested in coaching. Still think that maybe Babcock with his hockey Canada (Nicholson and Chiarelli) connections as I have the brief impression that Nicholson doesn’t p*ss about when it comes ot hires, and firings. Count me in for Subban. It would be interesting to he and Brossoit come up the ranks together. What will Pete want to do with our youth core if he deems them not heavy enough ? Seeing as Draisaitl and Nurse will be absent from that grouping and I doubt McDavid can change that lack of progression , . Trying to surround them has had little positive results over the years , and their progression has been less than adequate . If we use fab 5 how might the team fare with my list of players to perhaps trade for . B.Sutter, O.Maatta , Oduya and Seabrooke , Marleau and Thornton , Niedereitter , H.andD.Sedin , Burrows , Bieksa , Wheeler and Byfuglien , J.Stall , Zadorov , Boll , P.Kessel , C.Neil . Sedins with Kessel rather appealing . So many options , and have little idea yet how Chiarelli will go about building our team . Back to coaching for a moment. I’d like to see Nelson stay on as assistant coach and Hitchcock take over as head coach. The timing has never been there for him to come home but I think it would be the right move, right time. In the summer he could go back on 118th and repair bikes again. Joking of course! First and foremost get a coach that UFAs will play for. Babcock yes, Mcllelan yes, Hitchcock and Julian maybe… Next sort out the D with 1 trade and the rest Free agents. We stand a great chance to land seabrook at the draft. Chicago can’t go into the season as Boston did and then give up a player for pennies on the dollar. Pits burgs 1st, Marincin and another AHL asset and 3rd rounder. Does this come close? What Chicago does not want is a 6 million do,lar player. Solve their biggest problem by taking Crawford back in the deal while letting them retain a portion…9-11 mill in cap space might be worth a whole lot to them. Forget any deals with Boston. Instead, look at PC’s traditional trading partners….where did he focus his trades from? I suspect he revisits those relationships and sees what he can shake loose. Does PC also make it possible (key word-possible) to have a discussion with two UFAs named perry and dubnyk? I would be shocked if anything crazy (well, more crazy ) happened as you can’t talk to Free agents until late June and actually sign players until July 1st. Think it is also the draft when the Salary Cap is confirmed so think teams will sit and wait to see what they need to shed or how much they need to spend to hit the cap floor. Goal is not our biggest problem although it is one. The biggest problem is DEFENSE NUMBER ONE PRIORITY! While the defense is definitely very sketchy, the Oilers cannot begin the year with the version of Ben Scrivens we saw in 14-15. Between letting in the first shot in – I lost count of how many games – and having the puck handling skills of a blindfolded and drunk Cory Cross, you could have Robinson, Savard and Lapointe in their heydays on defense and still be digging pucks out of the net. Goaltending and defense are both PUTRID. Capital “P”, capital “U”, capital “TRID.